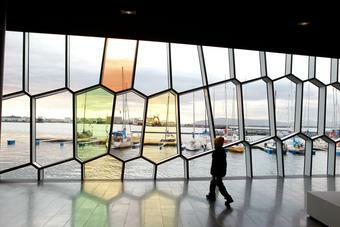 Reminiscent of the crystalline basalt columns commonly found in Iceland, the geometric facades of Harpa Reykjavik Concert Hall and Conference Centre were based on a modular, space-filling structure called the quasi brick. 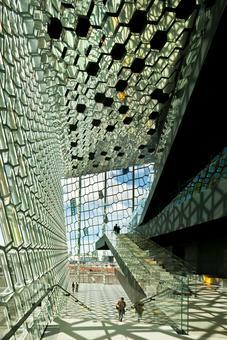 Originally developed by geometer and mathematician Einar Thorsteinn in the 1980s, following fifteen years of research into the topic, the quasi brick is a twelve-sided polyhedron consisting of rhomboidal and hexagonal faces. 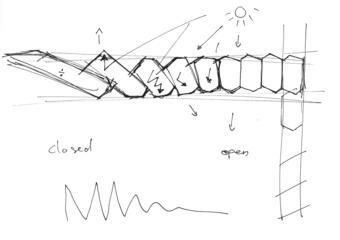 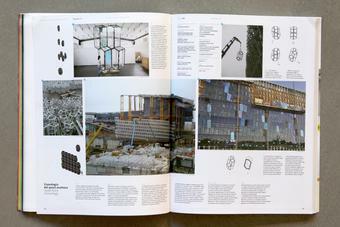 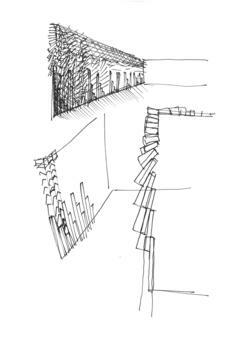 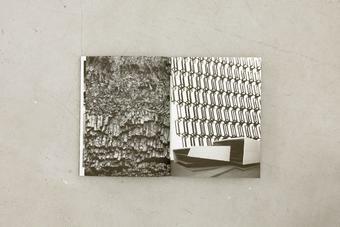 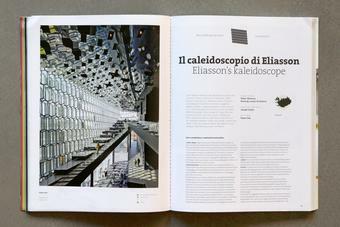 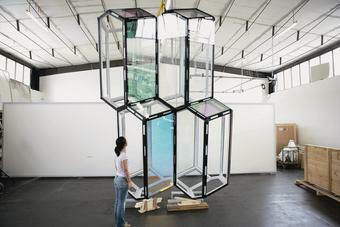 In 2002, Eliasson and Thorsteinn began investigating the potential for using the quasi brick in architecture. 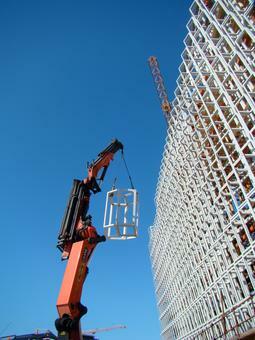 When the modules are stacked, they leave no gaps between them, so they can be used to build walls and structural elements. 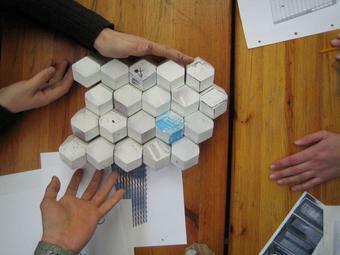 The combination of regularity and irregularity in the modules lends the facades a chaotic, unpredictable quality that could not be achieved through stacking cubes. 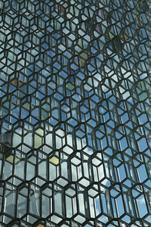 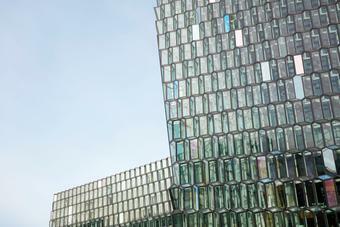 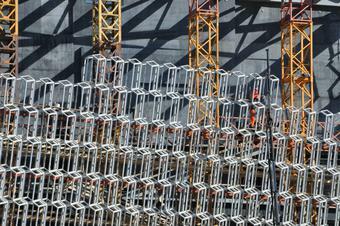 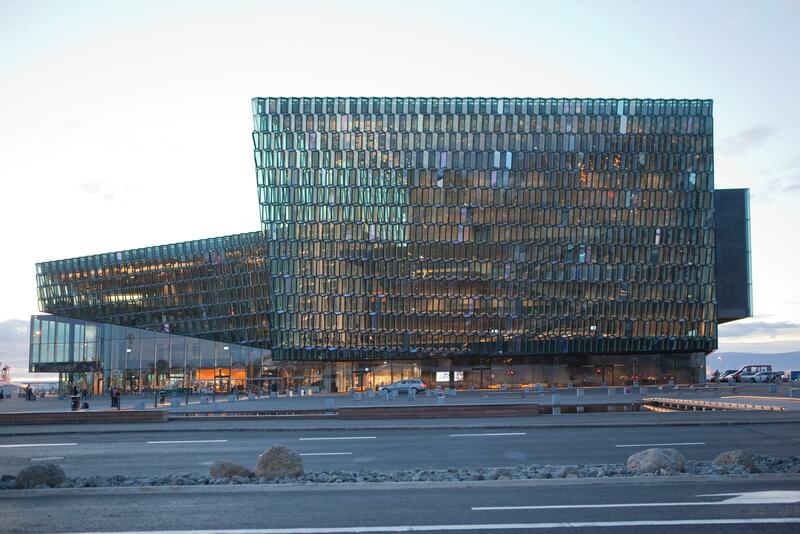 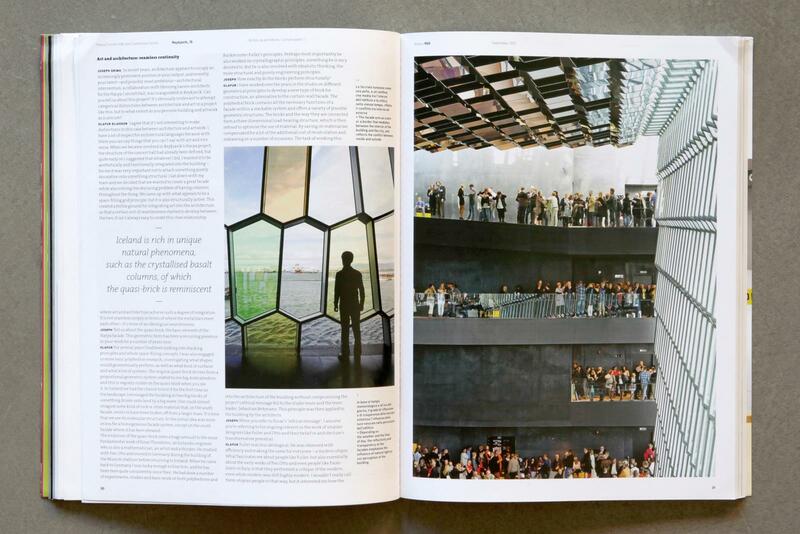 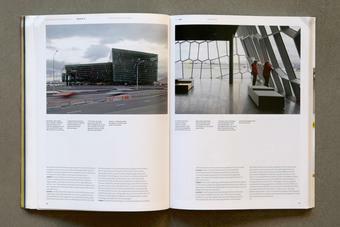 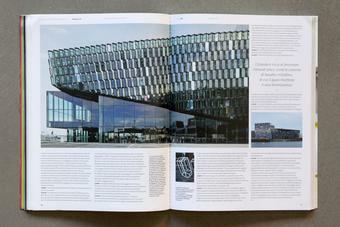 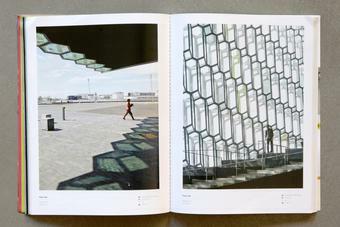 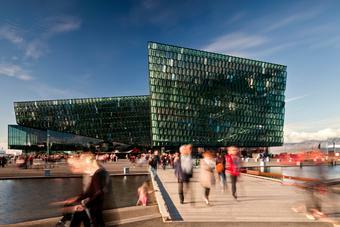 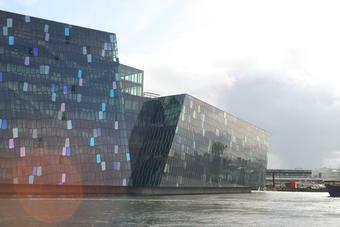 As a result, the facades for Harpa are both aesthetically and functionally integral to the building. 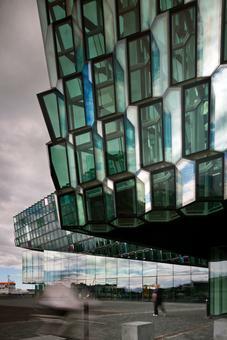 Only the main south facades of Harpa employ the three-dimensional quasi bricks; the irregular geometric patterns of the west, north, and east facades were derived from a two-dimensional sectional cut through the three-dimensional bricks. 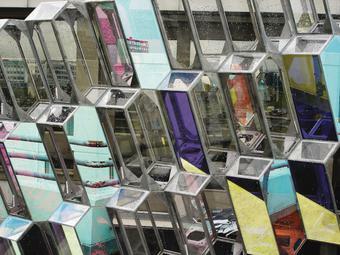 The quasi brick modules incorporate panes of colour-effect filter glass, which appear to be different colours according to how the light hits them; the building shimmers, reacting to the weather, time of year or day, and the position and movements of viewers. 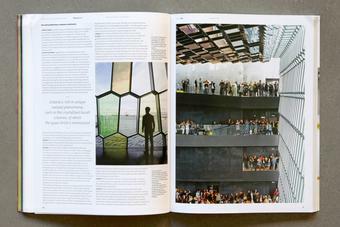 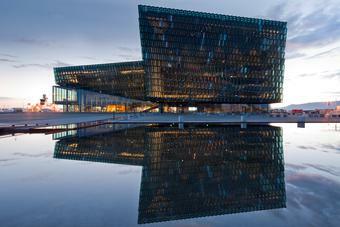 Olafur Eliasson and his studio designed the facades of Harpa Reykjavik Concert Hall and Conference Centre in collaboration with Henning Larsen Architects.